It can be difficult to choose between a wall mounted pull-up bar and a ceiling mounted pull-up bar. Pull-up bars are the best upper body workout tool at home as they give you a complete workout using our own body weight. If you are in the process of setting up your home gym and are serious about working out, then installing a reliable pull-up bar is a must. This is an efficient way to get more exercise into your daily life. It can be confusing which pull-up bar to choose. There is a broad range of options available and a number of purchasing choices to consider. The most secure and stable options are wall and ceiling mounted pull-up bars. They are guaranteed to be able to take heavy loads and even extra resistance added to your pull-ups. One of the highest selling wall-mounted pull-up systems from Rogue – the P-4 can give you all that you want when it comes to pull-ups. 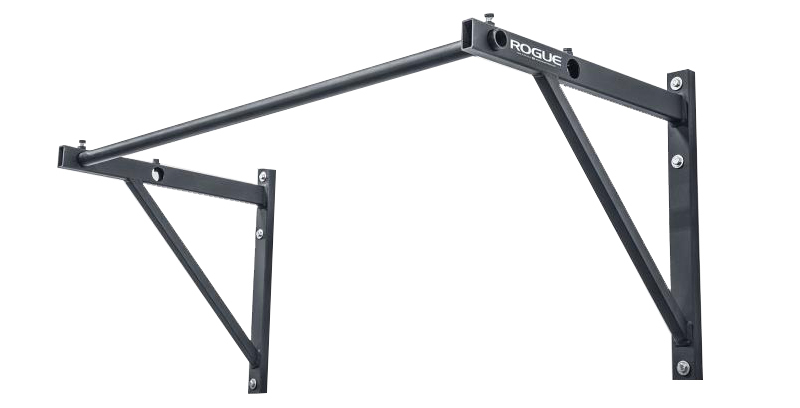 It has Rogue’s standard 11-gauge steel, 52” pull-up bar and it's strong enough so you can even mount rings from it. A difference between this and other models is that it has a depth of 30” from the wall which means you have adequate room for kipping movements. One thing to note is that if you’re considering this for ceiling mounting, your ceiling should be at least 9’6”. A tad bit lower in price than the award-winning P-4 Pull-up System, it doesn’t lose out that much in the performance department. It has typically robust Rogue branded construction and the only difference with the P-4 is that it has lesser depth than its successor. So, this might make it less ideal for some variations of kipping pull ups. Also, if you have a ceiling height lower than 9’6”, then this is the right mounted pull-up bar for you. If you are looking for the best priced solution, then Rogue P-6V/5V should do it. With a humongous weight capacity of about 1000 pounds, these are definitely great performers as well. With a design that is simple and built robustly, you can buy one or multiple 5V/6V systems to form a line of pull-up bars. If you are looking to add the ability to pull-up on your power rack, then these accessories are a necessity. This is a 70” single bar made of raw steel. The texture ensures that slippages are minimum and you don’t need all that much chalk. Because this is bare steel, it might require some maintenance over time. Looking for something a bit less traditional but a whole lot more difficult, the Crown range from Rogue can do it for you. 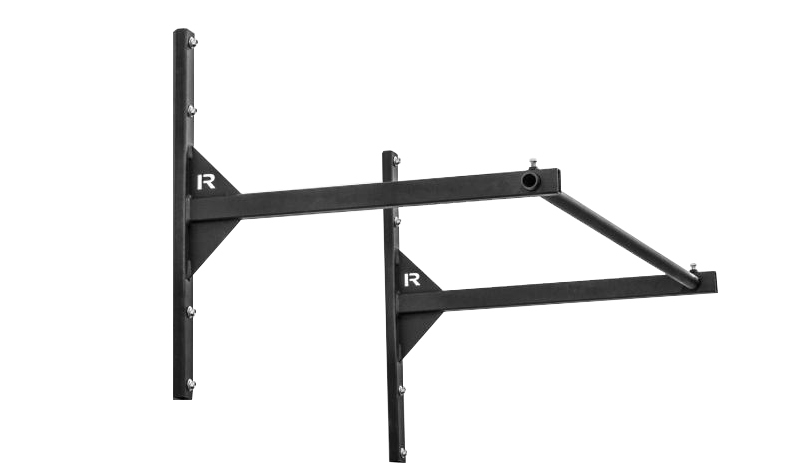 It fits 43 or 70” crossmembers or beams and has 2 sizes of pull-up spheres, 3” and 4”. It also has the regular grip and a bigger diameter fat grip to round off the complete grip range. For the consummate pull-up enthusiast, this has a lot of variety when it comes to grips and kipping pull-ups can be executed with a traditional grip. True to typical Rogue style, it is built solid and has a textured surface which holds chalk better meaning less risks of injury and mishaps. It has a length of 43” and is 6” in height. Pull-ups are a fantastic way to build lean body mass in a relatively short period. Due to the fact that you need more than one joint to perform them, you get to work out multiple muscles at a time. They are an excellent way to exercise your whole body, particularly your upper back. Your lower back, abs, biceps, and forearms are all worked out. You can do a proper pull-up with the help of pull-up bands. In order to build muscle, you need to increase the intensity of your workouts regularly. Pull-ups do not require you to buy fancy equipment to increase the intensity. You can increase the intensity of your workout simply by hanging a dumbbell from your feet or by strapping a weight plate to your waist. Compared to pull-up bars for doorways, ceiling and wall mounted ones will give you a more safe and thorough workout. Of the two, a ceiling mounted bar is more versatile when exercising and also allows for more freedom of movement. There is no wall or doorway to restrict your body movement as these bars screw directly into the ceiling. If installing a ceiling pull-up bar is not an option? 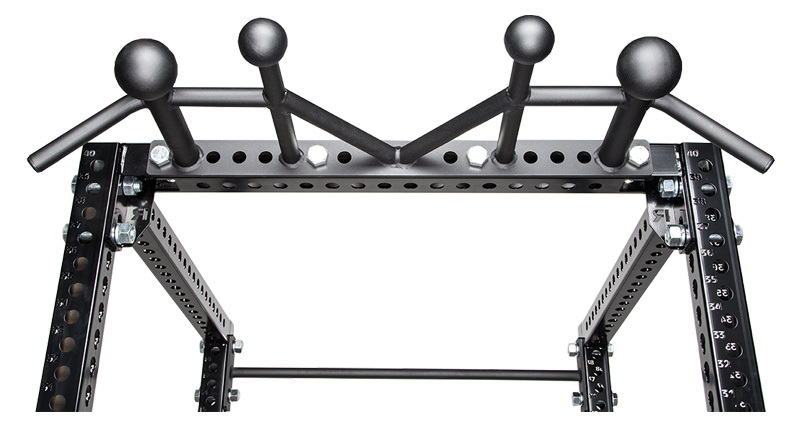 A wall mounted chin up bar is a great investment to achieve your fitness goals. These can be screwed directly into a concrete wall or wall studs. It is important to check that the bar extends at least 14 inches from the wall to allow for free-flowing movement when performing your pull-ups. Here is the list of best pull-up bars. The Number of Bolts: The more the number of bolts, the more stable and secure your pull-up bar will be. A good ceiling mounted bar, should have at least 6 mounting bolts. The Distance between Ceiling Studs: It is important to measure the space you have available and be aware of what you require before choosing a pull-up bar. The standard spacing between ceiling studs is 16 inches, but some are set at 24 inches. The Length of the Vertical Bar: the length of your bar must be enough to allow you to comfortably reach up to the bar while accommodating the ceiling height. If you are going to be performing exercises like muscle ups, the bar should also give you enough head clearance. Investing in an adjustable pull-up bar is recommended, as these can be set to accommodate various types of workouts and ceiling heights. Load Capacity: The main advantage of a ceiling mounted pull-up bar, is the ability to bear the heaviest load. So a good ceiling pull-up bar must be stronger than a wall mounted or doorway mounted bar. 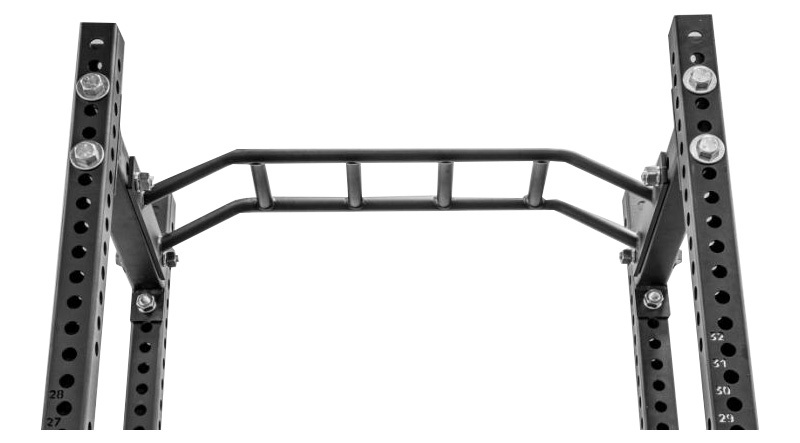 Some of the best in class ceiling mounted bars can bear up to 500 pounds. If your home gym cannot accommodate a ceiling pull-up bar, you can opt for the wall mounted option. Load Capacity: The pull-up bar must be strong enough for your weight and also be able to accommodate any extra resistance you decide to add to your workouts, such as kettlebells and dumbbells. A wall mounted pull-up bar will have a higher maximum load than a doorway pull-up bar. Ideally, opt for one with a max load of at least 400 pounds. Wall Clearance and Height: The pull-up bar stand must have a minimum clearance of 14 inches and most importantly, must be high enough up the wall so that you can stretch out and perform your pull-ups. Versatility: An adjustable pull-up bar will give you the flexibility to work with a range of stud distances and also allow you to perform various exercises. Look for a device which has an assortment of gripping positions and has flexibility for extra exercises such as dips. Unpack the bar and lay out the parts. This will help you ensure that you don’t have any missing pieces and gain an idea of what the finished bar should look like. Mark the location of the upper mounting hole. You can use the pull-up bar wall mount brackets to mark out the remaining bolt holes on the wall. Choose a good quality power drill. Pre-drill the hole, making sure you are using the right drill bit for your wall structure. The holes must be deep enough for the entire screw to fit. Using a hammer, gently tap on the pull-up bar wall mount bracket plugs. Ensure that they are flush with the wall. Assemble the pull-up bar and grips using the bolts provided. Attack the brackets and tighten the screws. Hang the pull-up bar from the drilled holes. Secure it to the joist using the long bolts, washers and lock nuts. Make sure that it is level and pull on the bar to test its stability. Tighten the bolts and check your installation to ensure that the pull-up bar is secure and attached in place. You can then test the bar with your bodyweight to make sure that there is no movement. Through extensive research, we’ve shortlisted the top ceiling and wall mounted pull-up bar options on the market. Talking several critical factors into consideration, we’ve chosen the top 3 bars. Highest Quality: Indicates the overall best pull-up bar tower among the countless options available, irrespective of the cost. Value for Money: This indicates the piece of equipment that is closest to the standards set by the best-in-class choice but at a more affordable price point. Most Economical: This is the choice for the top ceiling or wall mounted pull-up bar that comes at a reasonable price. This is a new product from Ultimate Body Press, a brand known for its high-quality fitness Equipment. It is designed ergonomically to reduce strain on your forearms and wrists and fits 24 and 16-inch joists. This ceiling mounted bar also allows for a complete back workout due to the fact that it has four gripping positions which are well padded. It is made up of high-quality materials and offers great stability and rigidity. The parallel bars provided allow for a neutral movement. The spacing between the parallel bar is 20 inches (unlike the more common 16 inches) which will make a huge difference to the efficacy of your pull-ups. Additionally, you can adjust the risers to fit the points of your ceiling joists with the dual risers available. The Ultimate Body Press Ceiling Mounted Bar also provides enough room for head clearance as it has a 14-inch bar drop from the ceiling. Click here to read our review of the "Ultimate Body Press Ceiling Mounted Pull-Up Bar". The Ultimate Body Press Wall Mounted Pull-up bar has great features and is available at a reasonable price point. The benefits are comparable to a ceiling mounted pull-up bar, but a ceiling mounted device will be more stable. However, as long as this wall pull-up bar is mounted well on a strong, well-built wall, it will give you plenty of stability and strength. The mounting plate holes are placed at a distance of 16 inches which is the industry standard. The wall clearance is an ample 14 inches while allows for functional dipping and pulling. Click here to read our review of the "Ultimate Body Press Wall Mounted Pull-Up Bar". This is a Joist Mounted Pull-up Bar with Neutral Grip Handles. The addition of these handles gives you more workout possibilities and the ability to exercise your back from different angles. This is a no frills piece of equipment that will give you reliable and stable workouts for a long time. Thanks to the ergonomically angled ends of the main bar, your pull-ups will be easier on the wrists. 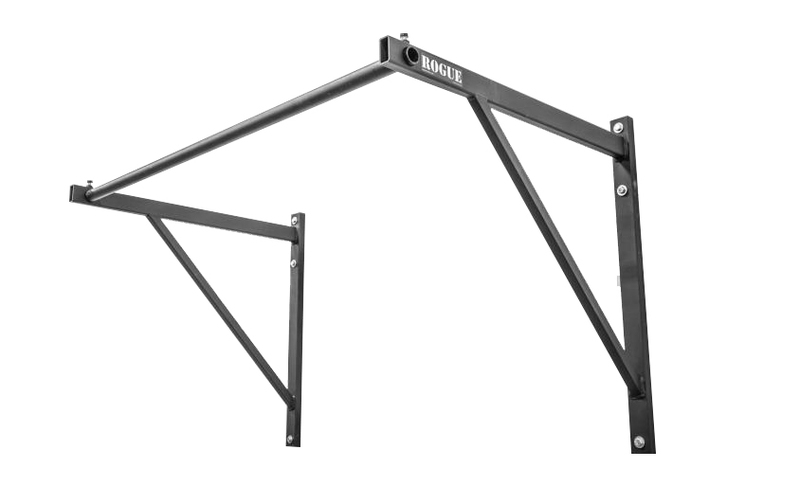 The 48-inch long pull-up bar allows for extra wide grip chin ups and pull-ups. It also has just one joint, to avoid any weak links. 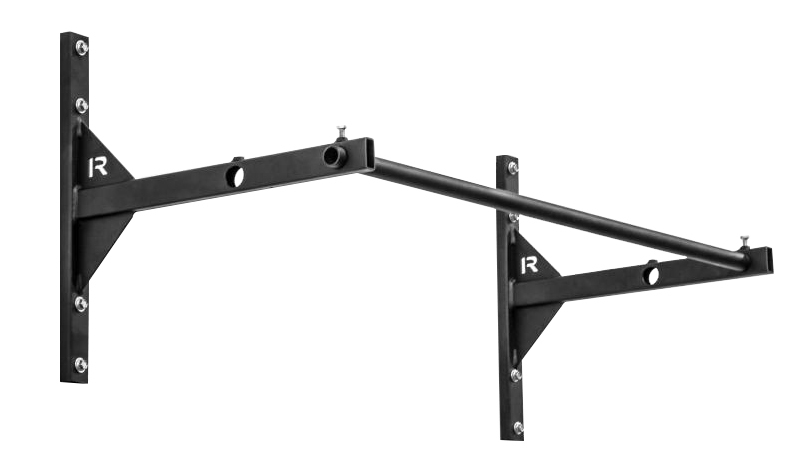 Click here to read our review of the "Joist Mounted Pull-Up Bar by MS Sports". Titan Fitness has a broad range of home and commercial fitness equipment including strength equipment, cages, racks and several others. Many fitness enthusiasts swear by their wall mounted pull-up bar, which is a top seller. 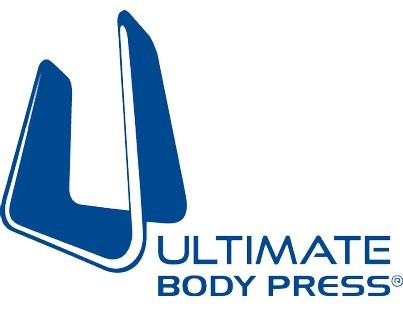 Pennsylvania-based Ultimate Body Press offer quality workout gear and home fitness equipment. They have a range of fitness gear like resistance bands, dip stations, and sandbags. They also regularly publish useful workout guides on their website, which is a great resource for fitness seekers. Xtreme Monkey is a brand that is part of the C & G Fitness Group. They are manufacturers of high-quality commercial and home fitness equipment. The Xtreme Monkey line has gained a reputation as an excellent resource for value for money fitness equipment. An added advantage is their superior after sales service. Pull-ups have a number of overall benefits. They rely only on body weight and therefore do not require any special equipment apart from an overhead bar or surface to grasp. Pull-ups are a great form of exercise with the potential to improve your fitness in many ways. If you are serious about making pull-ups a part of your fitness regimen, a wall or ceiling mounted pull-up bar is a better choice than doorway model. They are sturdier, can bear heavier loads and offer more functionality. Whether you opt for a ceiling or wall pull-up bar, it is important to be meticulous about the way that it is mounted. You will be motivated to work out more if you invest in a quality pull-up bar that meets your requirements.